One of the things I packed when getting ready for hospital was my crochet. 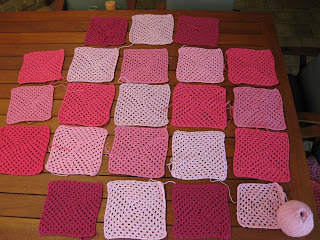 I thought, excellent... a few days of rest and recovery and lots of time to crochet, I'll get heaps done! Unfortunately this was not the case and apart from on the first day in I did no crochet at all. Oh well. When I got home I went to grab my hook and wool and just sat there staring at it, unable to remember what I was supposed to do. I couldn't even remember how to hold the hook. Thankfully, it has all come back to me and I have spent a few hours in front of the TV with my hook. I'm so close to being finished with all the squares of the pink granny blanket, I decided to lay them out and work out a pattern. I would love to do a higgeldy piggeldy one but my mind craves patterns and would just not cope! 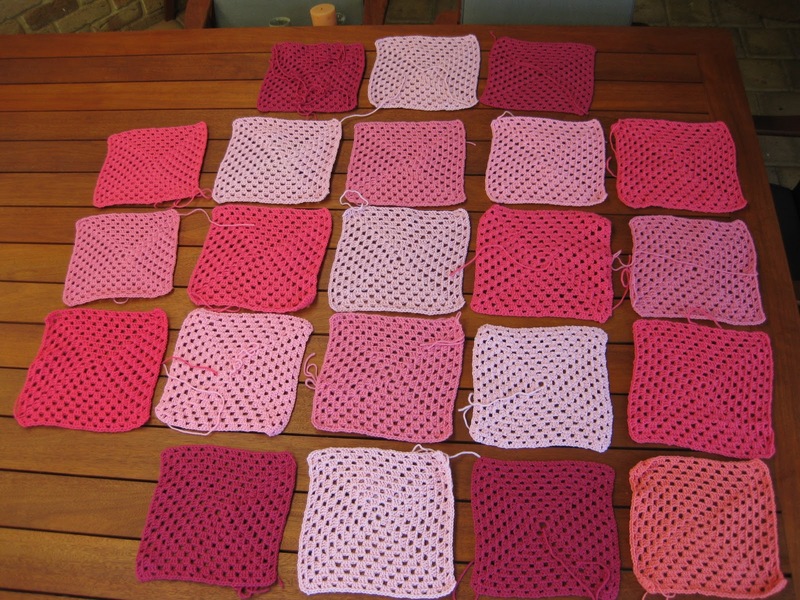 I also had to make a decision on a final colour, I had started off with a coral pink but my sister wasn't a huge fan and it looked a bit too orangey next to the pinks so I found another pale pink ball I hadn't used and began a square in that to help me decide. I love how taking a photo makes it so much easier to see colours and patterns. Easy decision, the pale pink. Then, I was looking through my craft room for some pins and came across one more square I'd missed. 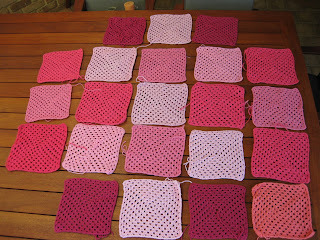 This was even better because from the pattern above I had a few left over squares that I somehow ended up with odd numbers of. Goodness knows how but there you have it. And so now I had two more matching. And ended up with this pattern, which I like even better. 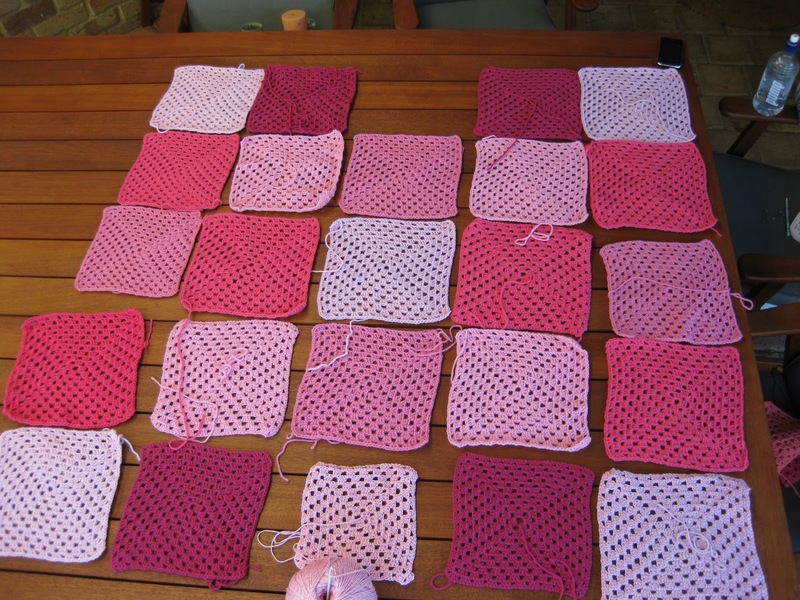 And it also means I only have just over one more square to go! Check out more creativity over here. I think that blanket is going to look so gorgeous when it's finished. I am a fan of coral but yes, you're right, it's pale pink that's best here. How do you plan on joining them? Can't wait to see the finished blanket! You're making such good progress. Loving all the pink. So sweet. Definitely the pale pink and I love the symmetry. I just can't have things willy-nilly!! You've done so well to have the crocheting finished! !